UPDATE: In what may be confirmation of a national trend, according to a Service Employees International Union press release today, the "non-tenure-track faculty," that is adjuncts and full-time instructors without tenure, at Loyola University Chicago have voted to join the SEIU Local 73, becoming the third Chicago group of contingent faculty to unionize with SEIU in the last two months. Ballots for the group of 326 full-time and part-time faculty within the College of Arts and Sciences were counted this morning at the National Labor Relations Board, which recorded 63 percent voting to join the local. More here. The nation’s 28 Jesuit institutions of higher education are often carefully scrutinized by prospective students according to academic performance, affordability and the vitality of on-campus spiritual life. Should those would-be freshmen consider adding faculty justice assessments to their checklists? A survey released in December by Faculty Forward, a national higher education labor campaign supported by the Service Employees International Union, assessed the nation’s Jesuit colleges and universities and their treatment of adjunct and other faculty, among other issues. Regarding the sheer number of part-time faculty, the survey results were not especially surprising, giving the increasing reliance of both public and private schools in recent decades on adjuncts and full-time, but not tenure-track instructors. According to the survey, the use of such “contingent” faculty is up sharply at Jesuit schools; many of those instructors are the adjunct professors whose working conditions and living standards Faculty Forward is attempting to publicize. Faculty Forward conducted the survey over the summer 2015. Over the last ten years, according to Faculty Forward researchers, the percentage of Jesuit faculty “working on a contingent basis” has grown from 47 percent to 57 percent. “This increase of 23 percent far outpaces the rate of 7 percent among all four year non-profit colleges and universities,” according to the report. The group suggests that “one major reason” for that lack of optimism is the precariousness of the adjunct or contingency professor’s position. Though they may teach the same classes as associate or full professors, adjuncts are part-timers, far removed from tenure-track. They receive no employment benefits. Many say that their per class payments amount to minimum wage or less when real-world work-hours per course are calculated. Adjuncts have no job security—each new term means negotiating new classes and of course income. A recent faculty census at Fordham reports that the raw number of non-tenured, part time academics has indeed increased from 681 in 2004 to 861 in 2014, but the number of full-time and tenure-track academics have also gone up. In terms of “full time equivalents,” that is teaching positions calculated by percentage of class time, Howe says that part-time instructors, who are limited to two classes each academic term, actually represent a much smaller percentage of classroom instruction at the university than Faculty Forward reports. Its head-count based survey reports 63 percent; his FTE-based analysis reduces the percentage to 28 percent. The diverging statistics may be the result of clashing statistical methodologies. What cannot be disputed has been the overall national trend toward more teaching by part-time academics nationally. An analysis from the Kalmanovitz Initiative for Labor and the Working Poor at Georgetown University in Washington reports that contingent faculty—defined as as part-time or adjunct faculty members, full-time non-tenure-track faculty members or graduate student assistants—now make up more than 75 percent of the nation’s “instruction workforce.” In 1970, only 18.5 percent of faculty members were part-time employees—a remarkable reversal. According to Faculty Forward, 15 percent of its Jesuit survey respondents report earning “so little at some point while working at a Jesuit school that they’ve received public assistance such as Medicaid, food stamps, or earned income tax credit.” In a different SEIU survey, “Crisis at the Boiling Point,” respondents, who included faculty at Jesuits schools, were asked to calculate the number of hours they work and how much they were paid: 16 percent reported being paid below the federal minimum wage of $7.25 per hour; 24 percent said they were paid below $10 an hour; and 43 percent said they earned less than $15 an hour. Trevithick is acutely aware of the plight of the contemporary adjunct. He has been an itinerant academic for years. Trevithick most recently cobbled together a full-time schedule of sorts with assignments at Fordham and two other New York metro-area schools. As a result, he says, too often his “office hours,” time when he tries to be available to his students, are conducted over cell phone calls during drive-time between teaching gigs, a commuter office that has become a familiar workplace to U.S. adjuncts as they drive to their various classrooms. He receives no health benefits from any of the colleges where he teaches, and the total income he derives makes life in one of the nation’s most expensive metropolitan areas a daily challenge. Contemplating the insecurity of his academic life, Howe’s “industry standard” references rankle. In an email, he writes, “It’s the ‘industry standard’ to cap the number of courses an adjunct is allowed to teach, as Fordham does, to two courses per semester, which requires the adjunct…to seek one or more other jobs elsewhere. Also, it's the ‘industry standard’ to provide no job security at all and to make it possible to cancel classes at the last moment, with conditional contracts, as Fordham's are, that must be signed every semester. It is also an ‘industry standard,’ and Fordham observes this very well, to provide adjuncts with no benefits whatsoever by way of health or retirement and no research or other professional funds. Contingent faculty now account for roughly 1.3 million of the 1.8 million faculty members and instructors in the United States, according to the study. Adjuncts alone make up approximately 50 percent of that 1.3 million. Joseph A. McCartin is a professor of history at Georgetown University and director of the Kalmanovitz Initiative. University faculty may not seem to fall naturally within his initiative’s purview. But, McCartin says, owing to their low pay, poor to no-benefits and wobbly career prospects, adjunct academics unhappily do qualify as members of the nation’s working poor. He explains, “Some people at the top are doing better in [the academic] ecosystem than those people have ever done, [and] … resources have not been distributed fairly across the ecosystem.” In practice that has meant academic and administrative stars draw outsized salaries, benefits and perks, straining department budgets that could have beenallocated to create more tenure-track, full-benefit teaching opportunities. That business world model, he argues, reflects a repudiation of the values of solidarity that one might expect a Catholic institution to be following. Academic organizing campaigns, McCartin suggests, “are a natural outgrowth of what has been a distorting process that has been underway. Workers associating together to “change the dynamic” has been a right endorsed by the church since its first document on social teaching, 1891’s “Rerum Novarum.” For Faculty Forward’s publicity purposes, that tradition is what partly made Jesuit schools an irresistible target. “We thought we could have a focused campaign [on Jesuit institutions] particularly because of Catholic social teaching” and because of Jesuit leadership on many contemporary social issues touched on by Catholic social teaching, Trevithick bluntly acknowledges. It is not much of a stretch to conclude that a Jesuit-targeted labor-rights campaign could anticipate broad endorsement within Catholic circles. Faculty Forward indeed has drawn support from Catholic Scholars for Worker Justice and other Catholic labor groups, even from within the Jesuit institutions themselves or from among their students and alumni. “Many full-time faculty and administrators think this is a lousy and exploitative system … and they agree [with Faculty Forward],” Trevithick says. It also doesn’t hurt Faculty Forward’s case that a former Jesuit provincial, better known now as Pope Francis, has made justice for working people a hallmark concern. He has even repeatedly expressed his displeasure with the poor treatment of the world’s teachers. Describing teaching as “a beautiful profession,” last March the pope said, "It’s a pity teachers are badly paid because it is not just about the time they spend in school, but the time they spend in preparation, the time they spend on each individual student.” An argument many a harried adjunct professor has made in demanding higher compensation. But adjuncts argue they are not the only victims of the transition to part-time instruction. Trevithick argues that students are being shortchanged, despite the spectacular tuition increases they’ve experienced in recent years. Time-stressed and commuting adjuncts, he says, many with extremely limited office hours, even without offices altogether, cannot possibly offer students the direction and assistance their high fees would seem to guarantee. A spokesperson for Loyola University said the administration remains “confident that our students are getting an excellent education” and flatly denied that the use of adjuncts could be interpreted as contrary to Jesuit values or the intentions of Catholic social teaching. 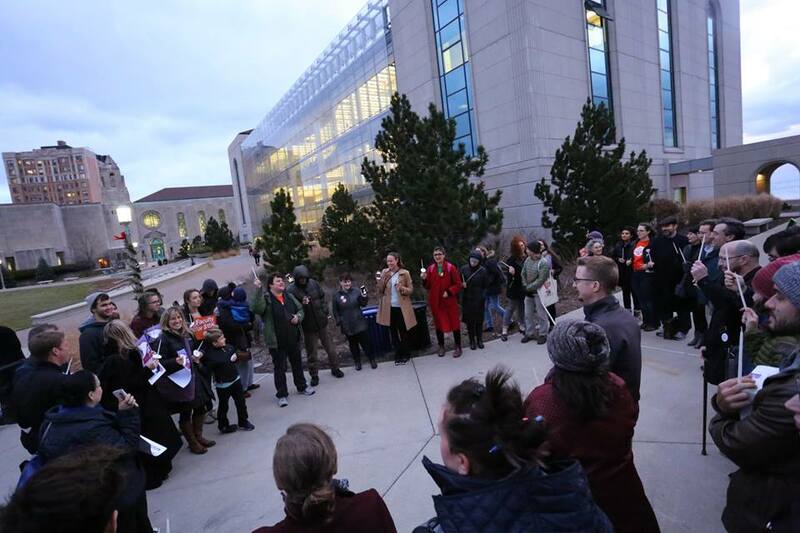 “We are confident that our adjuncts and non-tenured faculty are treated well and competitively paid,” the spokesperson said. One of those local approaches is now being tested in Chicago, where Faculty Forward is promoting a union vote through the National Labor Relations Board for SEIU representation of adjuncts at a number of Chicago schools. In fact on Dec. 9 University of Chicago adjunct faculty voted in a landslide to join SEIU Local 73, becoming the first Chicago-area adjuncts to unionize. The effort to proceed with a similar vote at North Side Loyola University Chicago, however, has been characterized by a dispute over competing rights that were not at play in Hyde Park. Loyola has challenged the NLRB’s authority to supervise a union vote on its campus. Its administrators contend, among other issues, that the university, as a religious institution is exempt from the federal board’s oversight. This has been a position adopted by a number of other Catholic schools in recent years. Some have become engaged in drawn-out and at times acrimonious disputes with their own faculty as a result. Alyson Paige Warren has been teaching English basics and literature at Loyola for eight years. She complains that it has been seven years since adjuncts have seen a pay raise at the school, but insists the fight to her is about far more than money. “We’re fighting to be known and to be heard. Warren says that many of her students, who simply presume that their instructors are well compensated, are often stunned to hear of the economic and career trials endured by adjuncts. Noting that some instructors rely food stamps to get by, Warren argues that precarious living directly affects the quality of education Loyola students receive. She adds, “If you ask the average student, they would be more willing for their tuition to go to educators and their education than a new food court or rock wall,” citing a few recent controversial investments made by the administration. But administrators at Loyola and other Catholic institutions insist that their resistance to NLRB jurisdiction is prompted by legitimate concerns over government overreach, religious liberty and optimal relationships with faculty. Religious Rights vs Workers’ Rights? McCartin adds, “In those cases where universities are disputing or reserving the right to dispute the applicability of the nation's labor law to the situations of workers in their institutions who are not involved in the transmission of religious doctrine, I think it is at the very least incumbent upon them to provide some alternative plan or mechanism whereby the workers can secure rights that the church has championed for 125 years, such as the rights of workers to organize and bargain collectively. On December 28, the NLRB, rejecting the university’s objections, ruled that it indeed has jurisdiction at Loyola because the petitioning faculty members were not performing “a specific role in creating or maintaining the University’s religious educational environment.” The board directed that an election by secret mail ballot should proceed, and ballots to Loyola faculty were mailed out in mid-January. The university has set up a Web site to track the NLRB process and communicate with staff and students. School officials have been urging faculty to reject the SEIU representation. Among other issues administrators say that the union, which has represented health care and service industry workers like janitors, nurses and security guards, is not properly experienced to represent academics. And in a message to faculty, Loyola’s Interim President John Pelissero writes, “Catholic social teaching clearly recognizes the significant contribution that unions have and can make to the rights of workers and the promotion of social justice, and supports the rights of individuals to form a union, but it does not suggest that this is a requirement or that it is the best or only means to reach our goals of greater involvement of faculty and improvements in shared governance and working conditions. The NLRB ballot count will be conducted on Jan. 27 and the results may be announced immediately. The outcome of that vote, and Loyola’s reaction to it, will no doubt be closely followed by administrators and faculty at Jesuit and other Catholic institutions around the country. Professors Fahey and McCartin are right. It's disconcerting to read administrators at Catholic institutions of higher education slide their way around confronting the fact that Catholic social teaching champions the central role of unions in delivering workplace justice. "By their fruits you will know them." The resort to "religious freedom" being promoted by the Bishops and obviously large Catholic institutions is really another embarrassment to Catholic history and teachings. On the historical side we see the argument being used now to assert the same authoritarian inclinations and arrogant attitudes as when the Church once taught that error has no rights and the imposition of a national religion was acceptable, indeed divinely inspired! On the justice side it's obvious that the actions being taken fly in the face of Catholic Christian teachings. Ultimately it makes the Church look like any other secular and self-promoting institution or business. The new evangelization indeed! So who is getting all the money? If tuitions at these schools are running more than $20K per semester per student? That can't cover the salaries of the professors? Seems to be a serious lack of transparency as to its methods and financial accountability. With the non-profit status no less. I can see school officials challenging the numbers. But even at a lower percentage, is there not a lack of fairness and justice here? This should be updated to reflect Loyola's reaction to -- and continuing intransigence and appeal for a religious exemption -- the vote in late January. It needn't have had to come to this, because the problem itself didn't appear overnight. The solution isn't that difficult. Follow the rudimentary social justice texts used in your high schools and pay your adjuncts a basic living wage. (Adjuncts are, after all, not Jesuits, and must worry about such things as food, shelter, and health insurance.) How difficult is this to grasp for an order loaded with PhDs who thunder at the injustice of a missing section from the house's five copies of the Sunday New York Times? There was no need for outside arbitrators, lawyers, and the tens and likely hundreds of thousands of dollars in legal fees that will be wasted -- and it is an outright waste -- over this. Jesuit schools have had opportunities for over a decade to pay their adjuncts more without recourse to the NLRB, lawyers, or unions. They refused to do so. In fact, many pay *less* than they did seven or eight years ago, and that is a deliberate, conscious choice which speaks volumes, as does the specious and derailing argument of Fr. Sheeran that some adjuncts teach without much need for compensation (judges, architects, corporate vice presidents). Tip: there are scales of pay within organizations you can use, and not all adjuncts are corporate CEOs, although that sort does seem rather well-represented on SJ schools boards of trustees. To paraphrase someone you might know: Love is better expressed in actions than in legal filings. Bob Howe sure come across as a 'toadie" for Fordham. Anyone teaching a new course puts in 6 hours a class. Grading Papers/Exams adds up to 4 hours per student. Office hours should be 4 hours a week. So the 135 hours really turns into 500 hours for a class of 40 students. $ 4,000 divide by 500 is $ 8.00 an hour. and get back to us on how you found your new experience. The fire at Notre Dame raised questions about God’s protection of sacred sites. But then how could God allow the destruction of Rome just one generation after Christianity became the official religion of the Empire?